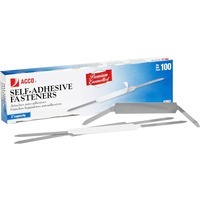 Premium self adhesive fasteners are simple and reliable. Constructed from durable, brown enameled steel the coined edges are smooth and safe. The permanent adhesive holds fasteners securely in place, but can also be used with compressor 70014 for an even more secure hold. Mutliple sizes available.